When You Get Control of Your Mind, What Will You do with It? When Your Mind Becomes Your Property, What Will You do with It? New thinking: When you gain control over your mind, whose world will you live in? Short lead (233 out of 250 characters): Do you control your screens or do they control you? In tomorrow’s digital world you’ll decide what’s on your screens. With a personal paywall you will be paid for your attention. You’ll be able to sell your mind as often as you like. Long lead (390 out of 400 characters): Do you control your screens or do they control you? Advertisers dive into your brain for free (to you) from the minute you begin to gurgle. In tomorrow’s digital world you’ll decide and filter what’s on your screens. One control will be a personal paywall so you can be paid for your attention. When this makes your mind into your property, you will be able to sell it as often as you like. (Optional) AFTER the lead, BEFORE the first image: This chapter from the new book, Imagine A New Future: Creating Greatness for All asks, when you gain control over your mind, whose world will you live in? Do you control your screens or do they control you? Advertisers dive into your brain for free (to you) from the minute you begin to gurgle. In tomorrow’s digital world you’ll decide and filter what’s on your screens. One control will be a personal paywall so you can be paid for your attention. When this makes your mind into your property, you will be able to sell it as often as you like. Today your attention is sold by all the media around you, and you’re forced to see, hear and think about what advertisers buy. They dive into your brain for free (to you) from the minute you begin to gurgle. You spend your whole childhood giving your mind away for free to those who sell your attention to others, until you grow up fully “prepared” to live your life the way you think is best. You think you have freedom of thought, but look at the products surrounding you. 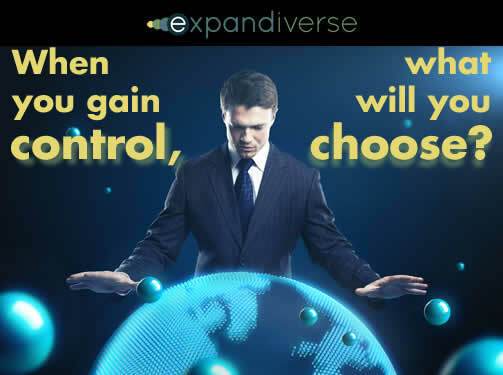 Do you control your world, or does your world control you? You already have some control, and you could have much more in the future. Take a look at your television screen. You simply turn off the shows you don’t want to watch, and let in only the ones you like. Or you record your favorite shows on a DVR (Digital Video Recorder), watch them when you want, and skip the ads you don’t want to see. What if Expandiverse Technology added that power to all your screens? 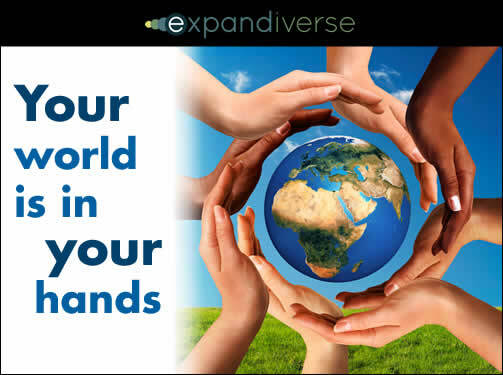 The Expandiverse adds boundaries that each person and group can control. In the future, Expandiverse Technology gives you Shared Planetary Life Spaces that you’ll control. You’ll gain visible boundaries that give you the power to filter content. If you don’t like the NRA, pull the trigger on them. If you hate gun control, blast away. What will you let in and what will you keep out? We’re moving to converged devices, even more use of screens, and a digital world that’s you-centered and follows you. The power to filter your screens and construct what’s displayed will change what controls your mind, your thoughts, perhaps even your attitudes. You already choose what to watch, but in your digital world the boundaries you set will be chosen by you, and automated for you. The power to filter and construct displays means you can also have a personal paywall so you can be paid for your attention. If you had an Expandiverse personal paywall, wouldn’t you restrict today’s advertising barrage to only the ads you want to see, where you get paid? Who would you say “No!” and give up that power! Even more curious, would you shut out all ads, or choose to watch more of them? The new world: Your mind is your property. How will you use it? After all, if you control what’s let into your Shared Spaces and displayed on your screens, your eyes and mind are turned into your property. That’s a new world. When you control all the screens in you life, you control your mind. This will be a reversal of fortune. You’ll stop working for free for every media out there. You’ll control your boundaries, and you’ll shut out what bothers you. But it won’t turn out like you imagine. To make money, many people are likely to see more ads, not fewer. Paywalls are a win-win because they work for the advertisers, for companies that sell ads, and those who are paid. 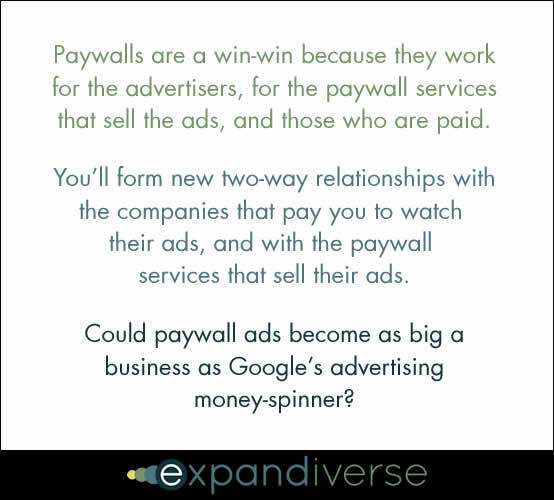 Could paywall ads become as big a business as Google’s advertising moneyspinner? Start by shutting out all cereal ads but indicate you’re willing to be paid to watch a cereal company’s ads. That identifies you and you become valued by vendors. You check your offers with an ad vendor, and the healthiest cereal company is willing to pay you the most. If you accept their offer, at the right times and situations to consume their products, that company’s logos and ads are blended into your screens so they appear on the screens you’re currently using. Do you get paid just because that company’s ads appear? Nope. You get paid when you perform the paywall behavior during one of their ads. If you’re eating breakfast you might need to pay attention (or look like you’re paying attention). If you’re in the supermarket you might need to buy one of their products. An evolution of customer-vendor connections is coming. With Teleportals, the new family of Expandiverse devices, your screens see you and your behavior. “Sentiment analysis” can assess your attitude. When you pay attention to an ad an impression is registered at the ad vendor. Then you get paid. If your “sentiment” shows you genuinely like their message, you could be paid more. With opt-in tracking the vendor will know what you buy, and if paying you works. They’ll respond to what you like and develop ways to treat you better and fit your needs. Together you’ll find win-win behavior that you both like. Personal, up close and part of your life. The underlying system makes sense. When you let an ad in through your paywall, it’s tagged with an identifiable “paywall action,” what you have to do to be paid. When you perform the action, ka-ching! As the “sentiment” connects, the mutual payoff grows. You don’t get paid for displaying an ad. Display without behavior doesn’t mean anything. Until you perform the action, your payment is nada, zilch. Your mind becomes your property. You’re free to sell it as often as you like. A new partnership capitalism: Does control mean income, sanity, or both? Counter-intuitively, a paywall may mean some people will pack their screens with logos, ads, product-filled backgrounds, blended in company buildings (McDonalds on all your screens? ), and other corporate symbols. Everyone will choose the balance that’s right for their sanity and their wallet. When companies pay you to make their ads part of your daily life, you’ll form new two-way relationships with the companies that pay you to watch their ads, and with the paywall services that sell their ads. The more they pay you, the more you’ll want them to stay in business so you can keep earning. Just let in their ads, do the paywall actions, and buy those products. A new kind of win-win “partnership capitalism” could emerge. When you gain filters and a paywall, you decide how you’ll live in your digital Life Spaces. You’ll control your mind. How well will you be treated when it’s your finger on the digital kill switch? Sounds great, except you’re used to going to work and getting paid. When your mind produces income, how often do you think you’ll sell it?